permanent condition in which they cannot change, but they are inherently resolute to not defining their lives in that way. An overcomer take on the challenges of life, living it to the fullest in spite of the reasons to remain status quo. 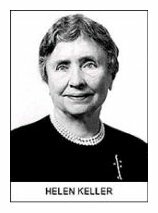 A most shining example of being an overcomer is Helen Keller. She had no ease in life being sightless, deaf and mute, unable to communicate easily with the audible language we all take for granted to first teach us. But yet, she was able to learn with much effort and patient teaching; and developed beyond those imprisoned states to become so much more! Fear, self-doubt and reasoning worry keep us locked in states of being, in conditions we don’t favor, in emotions which are negative . . but an overcomer takes on the hard work with courage, curiosity and a tireless resolve because they realize their greatness in life and the greatness of their life depends on being first an overcomer! Don’t let fear take your wings in life, don’t easily label yourself a victim who is unable, unwilling or just incapable. Be an overcomer and earn the rewards of taking on challenges even in the face of fear. Let your wings of courage and curiosity build a life worthy of your dreams and desires on the other side of your struggles, challenges and fears!